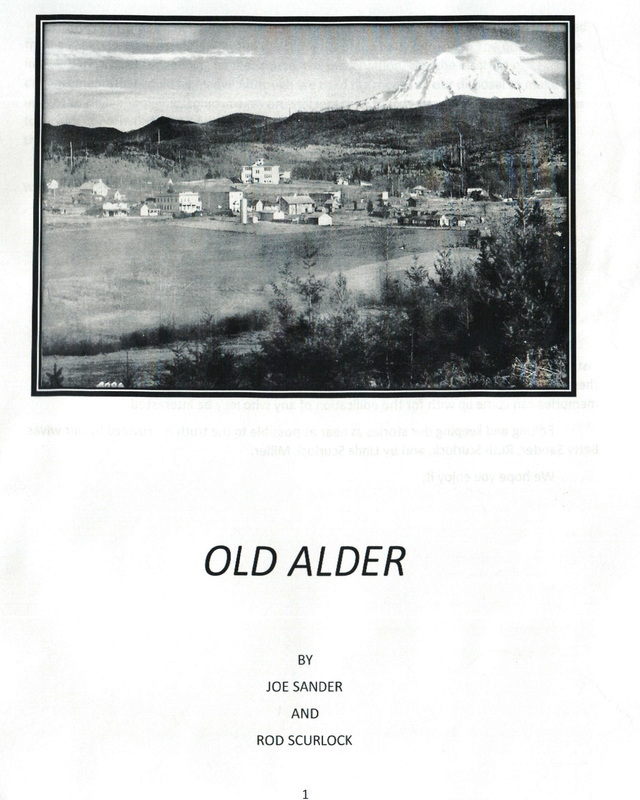 Old Alder is a great read by local historians Joe Sander and Rod Scurlock. The 191-page book covers the the first settlers to the Alder dam. You will read about how the town struggled, grew to 1,300 and then eventually was flooded when the Alder dam was built. Currently (March, 2011) you can purchase the book from Joe Sander, 360-569-2735, for $22.00. I’am interested in the crash of the Boeing 307 on March, 18, 1939 near Alder. Is het possible to get the email adress of Joe Sander to order a copy of his book, “Old Alder”. Would it be possible to get the exact location of the crash in latitude-longitude, as we plan to visit the side next year. Then the crash occurt 75 year ago. Did you receive your information you were seeking? I am a published author with three bools I have written, sold in 9 countries. I am currently doing a book on disasters in Washington State “Terror, Tragedy and Tears in the Evergreen State ‘ (copyright by Donn J. Moyer April 1, 2014. I would like to hear from anyone else who has information on the 307 crash of 1939 and especially from Ron Dijkstra if he is still eading messages on this cite. Would like more information on his relative that was on the fated flight. Neem a.u.b. contact met mij op via djmoyer55@telisphere.com . IK ZOU willen weten over uw familielid op de 307 die is gecrasht. IK schrijf een boek. Dankzij. Did you get your answers regarding your post? I wonder if there is any mention in your book about my family ancestors: My Great Grandparents, Thomas William “T.W.” Myers and Lelah “Lola” Blanche Mosier Myers, lived in Alder, Wash in 1911 to ?, with their growing family, of which my grandmother, Eulah Mae Myers, was born in Alder, Wash. in 1911. Later, they moved their family to California and settled there on a farm, in the Bay Area. In the book that I have they aren’t mentioned. But there may be mention of them in school records if they had children that attended the Alder school. Thank you for your response. Can you tell me where I ay locate these Alder School records?